Home » What’s the Best Cordless Air Compressor? Dewalt DCC2560T1 or Ridgid R0230? A few year ago, the thought of having a cordless air compressor that is able to be used on the jobsite was a pipe dream. You were crazy if you thought of such a thing! In early 2017, Ridgid has turned that pipe dream into a reality with the Ridgid R0230. And a couple of months later, Dewalt released its own cordless version – the Dewalt DCC2560T1 60V 2.5 gallon – a model that the company is touting as its most powerful cordless air compressor to date, so powerful that it can match a corded model in size. The benefits of a cordless air compressor are fairly obvious: You can bring it anywhere you want! It allows you to operate your tools without the disadvantage of being tied to an electric plug outlet. This freedom of movement makes cordless air compressors more convenient than their corded cousins. It often also means that a great saving in time and equipment cost can be made by avoiding the need for long cables, while still making it easy to carry out work in distant or otherwise inaccessible areas. Personally, I’m a big fan of the cordless power tools. The convenience of them makes most jobs so much easier. But I believe air compressor shouldn’t always be cordless. For anything that needs a lot of compressed-air or to run for a long time, such as impact wrenches and paint sprayers, I try to use a corded one. A cordless one won’t pack enough power long enough to do those jobs. However, for something like a nail gun, cordless works best for me. I used to use an electric pancake compressor (the DEWALT DWFP55126 6-Gallon 165 PSI) all the time, but now it’s rarely used. I have both a Ridgid R0230 cordless compressor and a Dewalt DCC2560T1 cordless compressor, they are awesome. Ridgid was first to come out with a cordless compressor and I jumped right on it. I’ve been very pleased with it. But I love Dewalt (as most all my cordless drills, cordless impact wrenches and lithium batteries are Dewalt), as soon as Dewalt came out with their cordless compressor, I switched over. So far, I’m using it more often than Ridgid’s. However, it doesn’t mean Dewalt’s is absolutely better than Ridgid’s. We have to do a head-to-head comparison of each model to know which’s the best cordless air compressor on the market. I will try to be fair and objective as possible so hopefully many of you will find this review helpful. Read more: What’s the best air compressor for Nail Guns? At only 21.5 lbs (without a battery) and 15 inches tall, the Dewalt FLEXVOLT 60-Volt MAX 2.5 Gal. 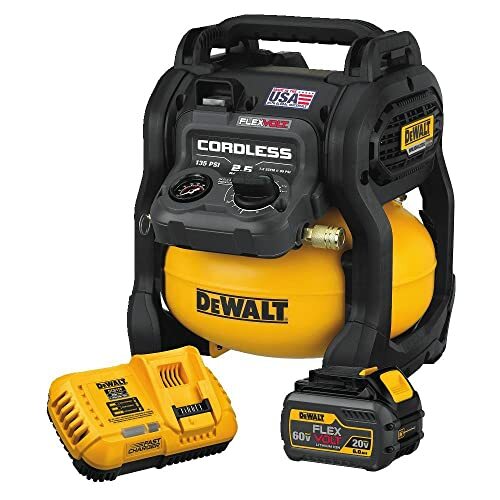 Cordless Air Compressor is a compact, portable, and lightweight choice for the job site. Each battery charge allows for up to 1220-nails on a single charge (using one DCB606 battery and a DEWALT DWFP12233 brad nailer), providing the run-time to complete a variety of applications. This cordless air compressor features a brushless motor. As you probably know the brushless motor is the best type of motor for cordless tools. The most obvious advantage of a brushless motor is its lack of brushes and physical commutator. This difference means that there are many fewer parts that can wear out or break and need to be replaced than in a brushed motor. A brushless air compressor tends to be more reliable, last longer, and be more efficient. In fact, it has life expectancies of over 10,000 hours. Another advantage of a brushless motor is that it generates less noise than a brushed motor because its internal parts are completely enclosed. The increased efficiency and reliability that a brushless motor offers, along with its low weight and small size, make this type of motor the best choice for a cordless air compressor. I have been using many Dewalt’s brushless power tools, they are all amazing. The DeWalt Flexvolt Air Compressor has the OneTurn regulator. This is a feature that allows the user to adjust the PSI without having to wait around for a regulated pressure gauge to catch up. With a 2.5 gallon tank and a CFM rating of 1.2 at 90 PSI, 135 max PSI, this wouldn’t be the choice for all-day framing. But it should be able to handle finish nailers, staplers, brad nailers, pin nailers, and other similarly sized tools with ease. I also like Dewalt’s oil-free pump. It makes the compressor lighter and much cheaper. If you are going to move the compressor around a lot and take it places you will want an oil-free compressor for its smaller, more portable size. An oil-free pump also reduces maintenance and does not mix oil into the compressed air. This is what you’ve all been waiting for. The most important thing to consider when choosing a cordless power tool is the batteries. I used to have a cordless drill that the batteries were always charged when I need it. But everything changed after I switched into Dewalt tools and DeWalt FlexVolt Li-on batteries. The DeWalt FlexVolt technology brings never before seen technology to the table and opens up even more tools to the cordless world. What makes it so revolutionary is that it is wired for both 20V Max and 60V Max – the tool tells the battery which mode to operate in so it’s completely automatic for the user. Electronic controls have given DeWalt the technology to wire the FlexVolt battery both ways to offer either extreme runtime in 20V Max tools or incredible power in 60V Max tools. This kit includes one fast charger and one 60V Max Flexvolt 6Ah Battery – but it is also designed to operate on flexible battery voltage including 20 and 120-volt units. I used a Dewalt 20-volt battery when charging the 60-volt battery to provide near continuous operation. Charging the battery took about 40 minutes. When the battery was charged to its maximum, it allows to shoot up to 1200 nails. I’ve never needed that many nails to get the jobs done. Because Flexvolt is able to automatically change voltages, you can use it for any other 20V Dewalt tools. This is awesome! The DeWalt Flexvolt cordless air compressor has a maximum tank pressure of 135 PSI and delivers 1.2 SCFM @ 90 PSI. I tried all of my air nailers from 1/2 inch brads to 3 1/4 framing nails and the compressor had enough air to drive them with ease. Its operation was relatively quiet. If you’ve got a full set of pneumatic nailers and can’t justify the cost of buying all cordless, this compressor is a great way to get air power to locations that don’t have power. Tank capacity at 2.5 gallons is limited so if using an air gun it does cycle a lot – takes about 2 minutes 22 seconds to fill, and when it cycles on after 40 brad nails at 70 PSI, it takes about 30 seconds to recover. The battery allows many circles before needing a recharge. Using a brad nailer, you can run for hours between charges. You can never say that you’ve never heard of Dewalt! Just like their drills, nailers and other power tools that they produce, this cordless air compressor is made with the same quality and reliability in mind. The battery charges extremely fast and the unit runs like a top straight out of the box with no assembly. If you want to have an impressive compressor kit, make your friends jealous, and blow your mind performance wise, buy this DeWalt Flexvolt cordless compressor. It’s the best cordless air compressor I’ve ever seen. 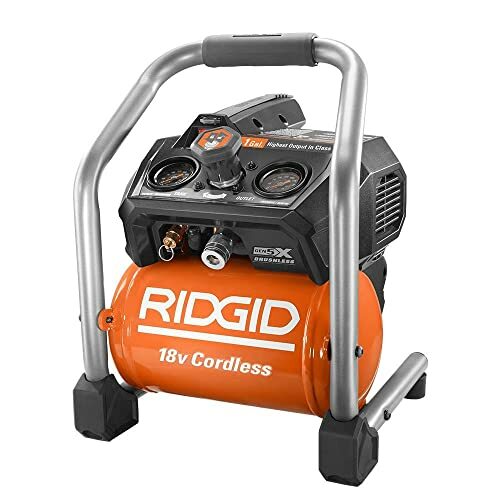 It’s also one of the top-rated portable air compressors on Amazon. The Ridgid R0230 Brushless 18V 1-gallon Air Compressor marks the industry’s first cordless air compressor. I do like the fact that it only weighs 19 pounds without the batteries and even with the batteries added is still easily moved around. To be honest, I was happy with this compressor. I spent about 2 months using it before I switched over Dewalt’s. Like the DeWalt Flexvolt compressor, this Ridgid R0230 uses a brushless motor for better run-time and less maintenance. With only a 1-gallon tank, it isn’t designed for powering a framing nailer or any higher CFM model. You can use it that way but the compressor will be running nonstop and the batteries won’t last long. With a CFM rating of 1.0 at 90 PSI, 120 MAX PSI, it’s ideal for those who is installing trim all day long with an 18 gauge brad nailer or a 16 gauge finish nailer but not for the home shop. Both tank PSI and outlet PSI area readable with the front-facing gauges. A large plastic regulator knob makes it easy for adjustment, and then pushing the knob locks the regulator from unintended changes. On the bottom of the Ridgid R0230 compressor is the 1/4-turn ball valve allows the operator to drain the tank when not in use. I’m living in Central Florida, with our extreme humidity, it doesn’t take long to build up quite a bit of moisture. Water is a killer to not only tanks and compressors, but it will make it’s way down the line to your tools as well. It’s a good rule to completely drain the tank before storing, to at least keep the corrosion to a minimum. The best cordless air compressor should be equipped with a good battery. This unit has the ability to run off either 1 or 2 RIDGID 18V-5Ah lithium batteries, allowing you to drive up to 1,200 nails per charge. I was looking forward to testing it out and had the perfect project in mind. The motor speed drops a bit when using a single battery, but the big loss will be run-time and cycle speed. As you’d imagine, so long as the tank is topped off, there’s no loss in output pressure. These batteries won’t be included when you buy the compressor. So you may be spending a little more than Dewalt’s. They are 100% compatible with all RIDGID 18-Volt tools and dual-chemistry chargers. As I said this cordless compressor is able to run on one battery, so if you don’t need the speed of two batteries, you can have one charging when using one. I don’t have the test specs on actual charging times, but it does take longer to charge than Dewalt Flexvolt batteries. That’s really not a problem though, since it lasts all day, I just put it on the charger and leave it overnight. The battery also has an energy gauge so you can see the charge. Like all the Ridgid batteries, it slides into place easily and securely locks in place. I used this cordless air compressor with a Ridgid pneumatic finish nailer to build some rustic shelves and furniture features in the shop. With a 15 gauge nailer I could fire 7-8 shots, with a 16 gauge nailer I fired 8-9 shots and with an 18 gauge nailer I was able to fire 9-10 before the compressor would kick on. That does not sound like a lot, but what made that tolerable was the low noise from the compressor and the quick recovery rate. Tank capacity at 1 gallon is relatively small so this cordless air compressor is ideal for trim projects. I used it with a finish, brad, and pin nailer and there was no problem. I also used it to pump up car tires. I took a tire that was on the shop floor, drained it to 20 psi and refilled it to 36 psi in about 20 seconds. The compressor was running while I filled the tire and you could watch the PSI in the tank drop to match that of the tire. The compressor was able to push through the quick pressure loss and hold 50 PSI allowing me to keep filling at a good rate. So did I like it? Yes! 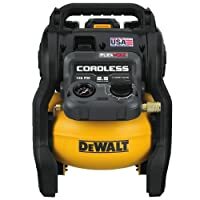 Is it the best cordless air compressor on the market? Yes! But that was before the Dewalt Flexvolt 60V Max appears. The Ridgid R0230 isn’t for everyone, but there are a ton of people who I think will welcome this compressor. For the professionals, it’s great for a trim guy. You don’t have to worry about an extra power cord. Plus with pneumatic nailers, they tend to be smaller than battery-powered nailers so you will still be able to get into tight spots. For me, it’s a great tool to fill up my kid’s tires or their toys. I hope Ridgid had offered this unit as a kit with the 2 high capacity batteries and a charger. I hate that everything is bought separately, especially when it is all advertised together. What’s the best cordless air compressor? Item Weight	 21.5 lbs. 19 lbs.